The thing is, after the magazine was shown to everybody I know, including the news stand guy and the doorman in my building, I read the magazine cover to cover, and it is a GREAT issue. The photos are fantastic, several great recipes and even an interview with Heston Blumenthal (see, Heston? We are magazine mates!). 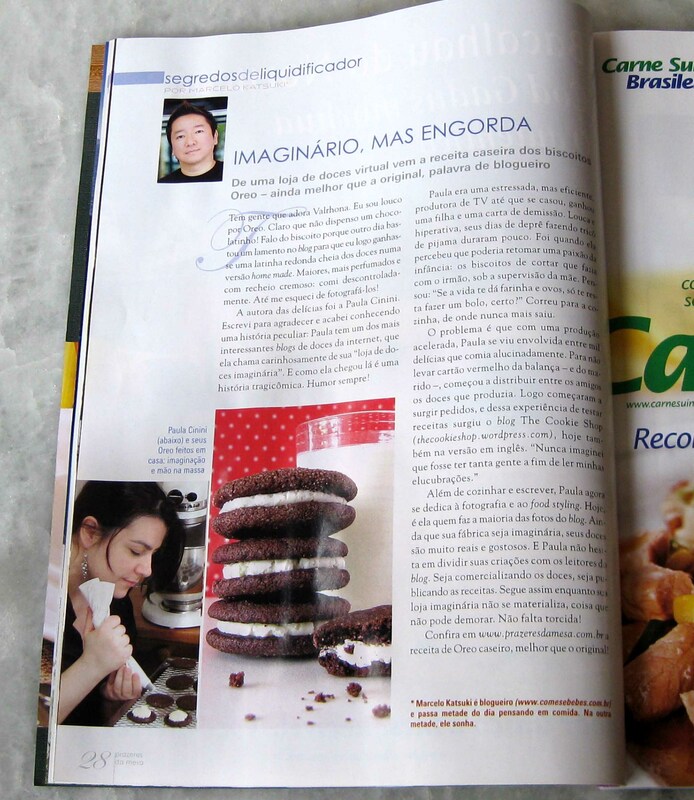 But the story that really caught my attention was a beautifully written article about traditional northeastern (Pernambuco) Brazilian cakes. These cakes and sweets are so special they were even matter of important sociological studies. 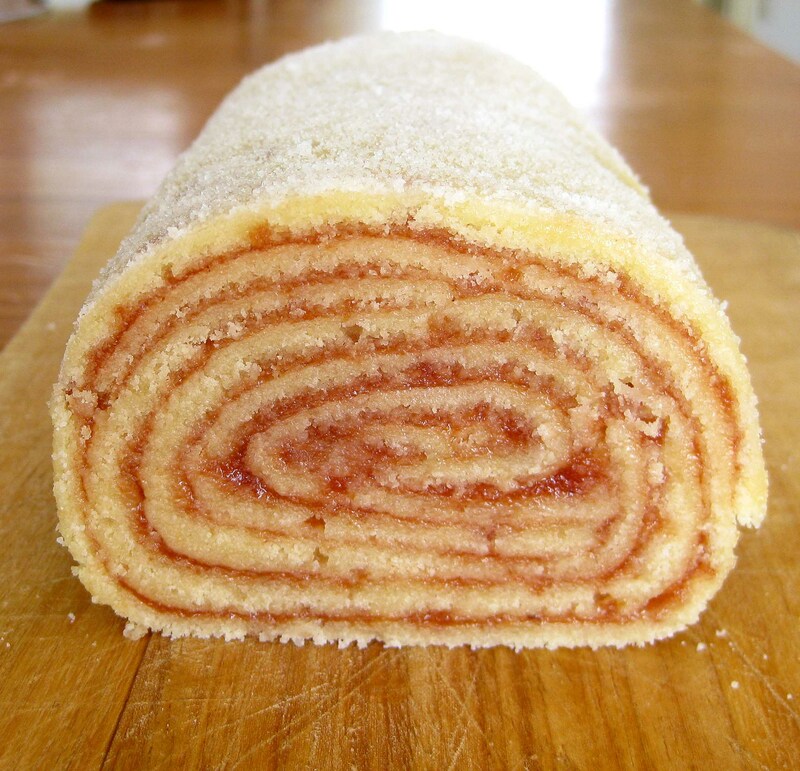 There’s this one recipe, though, that is my all time favorite: the guava roll cake. If you’ve never heard of it, let me try to explain: 13 layers of very thin buttery batter, baked very quickly, rolled with a Port wine and guava jam filling, served in very thin slices. For me, it’s one of the most delicate and gorgeous Brazilian sweets, and SO delicious you would become addicted to it. It’s not an easy cake to put together, the one pictured here was my third attempt, and it’s not perfect. But I’m very happy with the results because it had a taste of victory for me. The trickiest part of this is releasing the delicate layers from the baking sheets. Although the original recipe asks for a large baking sheet to bake the cake layers, I found it easier to deal with smaller pans, so I ended up with two smaller cakes (one of them filled with dulce de leche). As my friend Renato says, it’s crafty but not impossible to make this recipe. Just choose a day you are up for a challenge. It’s in Portuguese, but the blog Rainhas do Lar, has a great tutorial with pictures that might be useful. If you can’t find guava jam, you can substitute with any other jam, strained or processed. In a bowl, mix the jam and the wine until smooth. If using goiabada, cut in little cubes and cook in a small pan with 1/4 cup water until it melts and gets liquid. Add the wine, stir and let cool before using. Grease a large rimmed baking sheet with butter or cooking spray and line with parchment paper. Grease or spray the paper again. Place a clean kitchen cloth in a work surface and sprinkle generously with sugar. Reserve. In the electric mixer, beat butter and sugar until fluffy and light. Add one egg at a time, beating well after each addition, about one minute. Add the flour and beat only until smooth. With an offset spatula, spread a very thin layer of batter on the baking sheet. Make it the thinnest you can, but be careful it’s so thin you can see the bottom of the baking sheet. This is a tricky part: bake for 3 to 5 minutes only. You want a baked but not golden or dry cake layer, otherwise it will not be flexible enough to roll without breaking. After many lost layers, I found that its easier to release the layer if you let it rest for a minute or two in the pan. Turn the pan on the prepared cloth and peel the parchment carefully. Spread a very thin layer of guava filling and using the cloth, roll the cake. Now… you do that all over again! Place a new parchment on the baking sheet, spread the batter, bake and unmold. After spreading the filling, put the already rolled cake over the new layer and roll again. Repeat this process until you finish the batter. 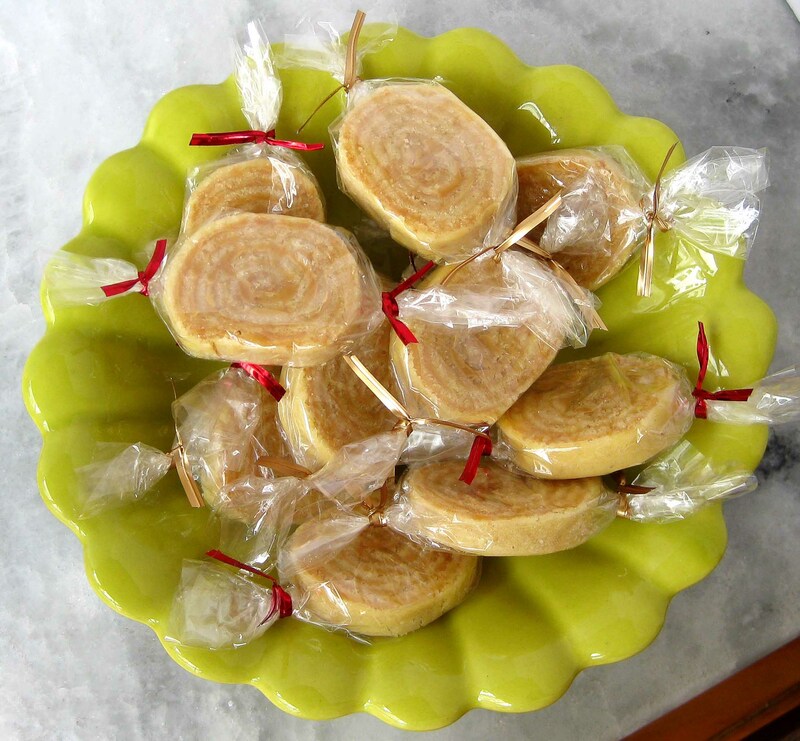 Wrap finished cake in parchment paper, close the ends like a candy and let it rest in the refrigerator for one day. Trim the ends and serve at room temperature in thin slices. That is SO great! Congratulations!!! I’ve just e-mailed my long-time, best friend in Brasil to complain that she’s never served this to us! It looks delicious and refreshing. Congratulations on the press recognition, and thanks for another inspiring post. How exciting for you and congratulations. Thank you too for this recipe. I have just finished making some guava jam so I might give these a try. what a mesmerizing and stunning creation! i’m so impressed–your recognition is well-deserved! That is exquisite! So exciting you were in a magazine! Congrats on being featured in a magazine…Wow!! You must feel amazing! Your cake is absolutely beautiful. I love trying all different kinds of cakes and cookies (who doesn’t) and I know I would adore this. I don’t know if I would have the patience to bake it though if it’s tricky. When I am dealing with kitchen disasters, things are usually flung (with lots of anger) in the garbage with a few choice words!!! Conratulations on the magazine feature! This is fantastic and how kind of the man who you sent the momemade Oreos to! Also very kind of you to send him the cookies in the first place! I love love love your blog….I have a three year old and i am constantly looking online for ideas and recipes to try.I stumbled upon your website while looking for ideas for my daughter’s birthday party and couldn’t take my eye off all the yummy recipes you have posted. YOU ARE AMAZING! 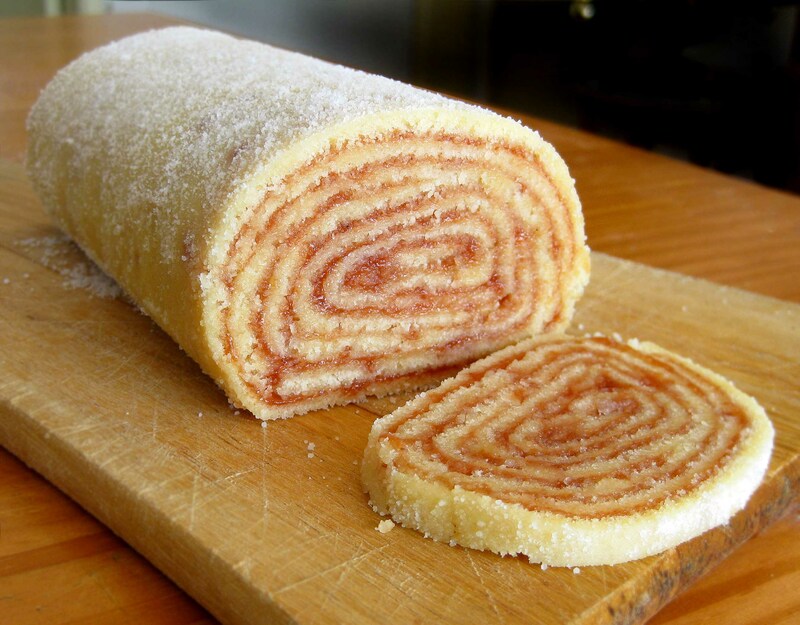 I plan to make the guava cake roll using Goya guava jelly. Can I use red wine instead of port wine???? I am not a wine drinker and am not sure if this substitution can be made. please let me know. Hi Sarah! Thank you so much! Port wine is a little stronger and sweeter than regular red wine, I think the flavor could get lost in this recipe. I guess it might work with fruit liquers, like cassis, strawberry or cherry. If you don’t have any of these options, just live the wine out, it’ll be just as delicious. Good luck and please let me know how the cake turned out! We got snowed in real bad yesterday ( I live in Brooklyn,NY) and I thought it was the perfect day to try out your guava roll cake. The aroma filled the whole house and the taste was amazing. My husband couldn’t get enough of it and my daughter was licking her fingers. I tried it with red wine and it tasted alright though I am sure it tastes better with port. Of course, I couldn’t cut it to perfection like your pictures but it tasted great and I guess I can always work on that later. My mom used to make something similar (sponge cake with jam in it) when I was little and this just took me down memory lane . Thank you again for all your wonderful recipes and keep them coming…. I’m from Recife and grew up eating this delicious cake,but never heard of it being made with Port wine.The ones I grew up with and make at home have plain guava paste and a little water ,mixed in the blender and then warmed up in a saucepan.Living ang learning! I tried it! It tasted pretty good…. but I think my layers were way too thin…. they were almost like crepes. I though it would raise some… so next time I’ll make them a little thicker… Thanks for the great recipe and tips. 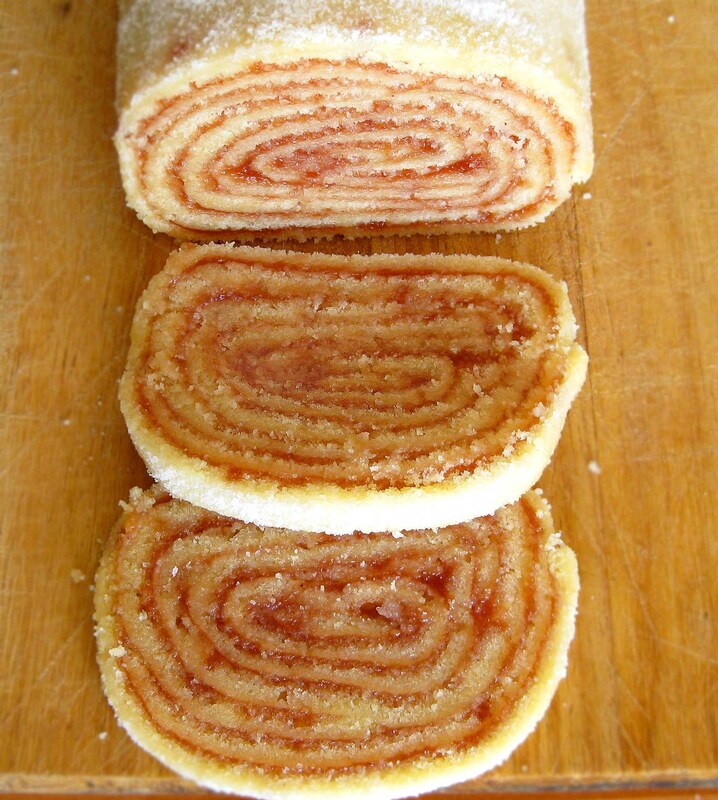 is it possible to purchase bolo de rolo here in the us? I really don’t know, but I’ll try and find out, ok? Lovely site and looking forward to trying your amazing recipes. Hello from Norway. Inspired by the world cup I wanted to try a Brazilian cake, and after finding your post I decided to have a go at the Bolo de Rolo. I had never tasted guava jam before, and had some trouble finding it, but I finally managed. It turned out pretty well; it tasted very good (although very sweet for my Norwegian palate) and I think I did a decent job rolling it, which wasn’t easy. Thanks for the inspiration and your helpful tips. I saw the photo on your flickr page, it’s perfect! And yes, the desserts here tend to be a little on the sweet side. Well done! This is absolutely fantastic looking. I’m reading and re-reading and have full intentions to try making this soon. I did wonder if you folled the cooked cake batter from the long side of the short side. How many layers did you have to bake to get the side in the photos? Thank you for your further explanations. I roll it from the short side, because this way I don’t have to bake too many layers! For the cake in the photo I used about six good layers, but I think I might have broken a few others until I get that size. Good luck! !